How Far Along: 37 weeks Size of baby: A bunch of swiss chard? About 6lbs and 19in. 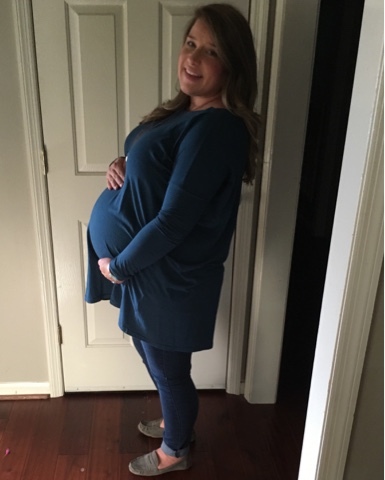 Maternity Clothes: All bottoms are maternity except one pair of sweat pants that I'm pretty much living in at home. Tops and tunics are still not maternity. I have 5-7 outfits that I wear every week. Movement: She's still pretty active. They had a hard time getting a good heartbeat this morning at the doctor because she was so busy. Sleep: I need approximately 14 hours of sleep a day and I'm doing good to get 8. What I miss: Not being pregnant. Drinks with dinner. Moving without pain. Not going to the restroom every 5 minutes. Just to name a few. I'm so thankful for this baby and pregnancy but I'm ready for this baby to be on the outside now. Cravings: Fruit. Orange juice. Symptoms: I've had a few contractions and I'm really nauseous again. I'm just exhausted mostly. Went to the doctor this morning, no progress. Which I know doesn't really mean anything so I'm trying not to get discouraged. The uncertainty is possibly the hardest part. Best Moment this week: I'm declaring the nursery complete. There are a few more things I want to do but they'll have to wait. I want to finish Barrett's room. His is mostly done I just need to hang a few things on the walls. Our bags are mostly packed. Just need to get the house clean and we'll be ready.